A regional publisher’s pro-European Union newspaper is set to exclusively serialise Alastair Campbell’s latest volume of diaries from tomorrow. 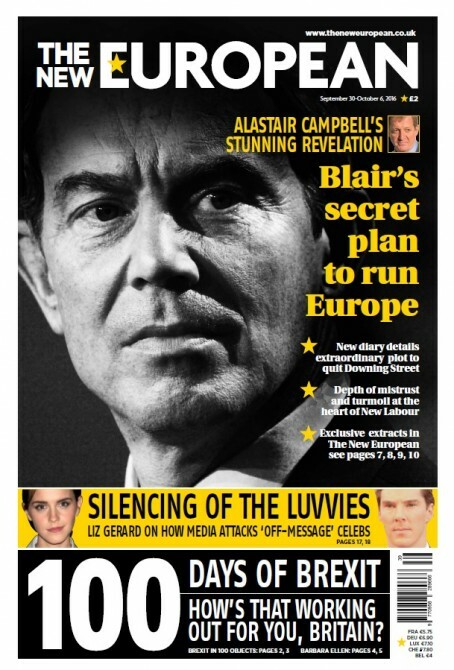 Archant’s venture The New European has announced it will print extracts from the book by Tony Blair’s former director of communications and strategy over the next three weeks. The first instalment in tomorrow’s edition, pictured below, reveals former Prime Minister Mr Blair’s secret plan to quit No 10 and run to be President of Europe. As part of the serialisation deal the newspaper will also be offering a new subscription package, with a copy of Mr Campbell’s book available free with a 13-week subscription. The diaries, entitled Outside Inside, are published by Biteback Publishing and cover the period between Mr Campbell’s resignation as Number Ten press secretary in 2003 and Mr Blair’s third election win in 2005. Biteback publisher, Iain Dale, said: “Alastair has never before published his post Downing Street diaries so every word is new and because he never really left they offer an incredible insight into an extraordinary period of political history. Mr Campbell added: “A lot of the time the press exaggerated our difficulties. This was one period where if anything they underplayed them because they didn’t know just how bad things were. “This was the closest Tony got to leaving and at the time I was terrified it would get out because it was one of those stories that would have taken on its own momentum. “Tony had pretty much had enough and was being ground down by Gordon [Brown]. In the end he realised that and decided he had to stay and see it though. hats off to Archant. and a stunning cover. The European going strong! !